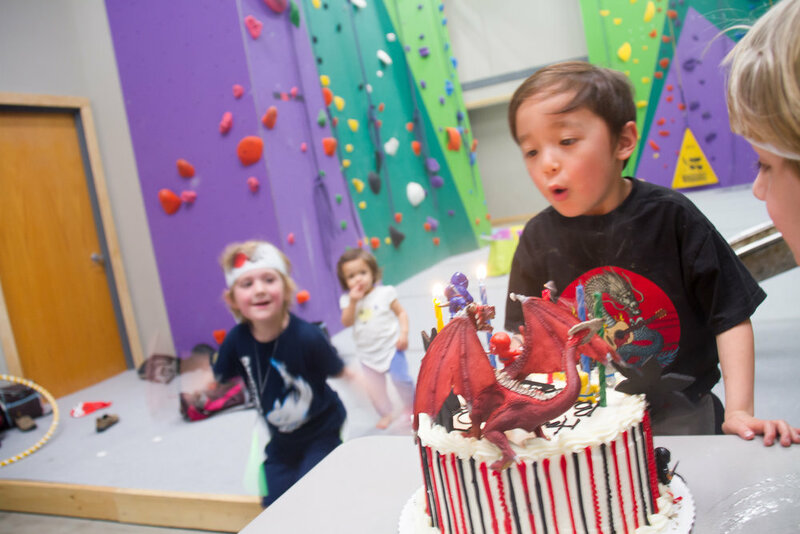 CElebrate your next birthday with a rock climbing party! Exclusive access of our private party room for two hours: climbing walls for all ages and abilities, a small top-out kids bouldering wall with a slide, and the use of 7 auto-belay systems. COST: $25/participant. Minimum of 6 participants, maximum of 20 participants. Onsight Members receive 10% Discount* on Birthday Party Bookings! *10% Member discount applied at checkout. You must inform a staff member that you and/or your child that is having his/her birthday is a Member at Onsight during checkout in order to receive your discount. ADD PIZZA (Optional): $15 for each one topping 14-inch pizza from Sergeant Pepperoni's! MINIMUM ORDER OF 2 PIZZAS. Each pizza serves an average of 6-8 kids. Price includes delivery fee + tip. Plates/Napkins/Utensils included with pizza order. Drinks not included. Additional days and times may be available upon request. All participants, chaperones, and spectators MUST complete our online waiver PRIOR to arrival. All participants under the age of 18 will need an online waiver signed in advance by his or her parent or court appointed legal guardian. Parties begin promptly at the scheduled time. Please make sure guests arrive 15 minutes early to ensure a smooth check-in. Due to the size of the private climbing area, we ask that groups with 12 or more participants limit the number of non-climbing spectators. A deposit of $100 is required at the time of reservation. Deposits are non-refundable on cancellations made less than 1 week prior to the event. Deposit amount will be applied to the total cost of the party. Parties must be scheduled at least 2 weeks in advance. Final participant count must be confirmed at least 1 week in advance. Groups must supply all food, plates, cups, napkins (unless using Onsight's pizza delivery and/or drink option) and party decorations. Participants encouraged to wear comfortable clothing and athletic shoes. Climbing shoes will be available for rent for $4. "The staff were so patient with the kids, and everyone had a blast. I would HIGHLY recommend Onsight for a birthday party!" "According to my son this was the best birthday party ever. The kids loved it and this mom did as well! Highly recommend." "Great birthday party for my son. What an awesome experience. Thank you for a memorable time. We will definitely be back!!!" "We had our 7yo son's bday party at Onsight Rock Gym! It was, by far, one of the best birthday parties we have ever been to!" "We had my son's birthday party here and it was wonderful! The staff was very friendly and went above and beyond to meet our needs. The private party room was awesome and the kids loved it. All the other parents were very impressed as well and want to book their next parties here. We will definitely be back!" "They were all very professional, friendly and knowledgeable. It was a blast. Everyone had a great time." "We had my 8 year olds birthday party here! Awesome place! Awesome staff! It's hard to have a birthday party in January that everyone loves and everyone loved it!" "Had my daughters' 10th and 13th birthday parties at Onsight. It was fabulous! The staff was knowledgeable, helpful, and enthusiastic the kids had a wonderful time and can't wait until we can visit again."